It hit you, huh? Me too. What a great quote. Wishing I could be completely nostalgic and find Heaven on earth. Don't we all? Please let us know when you find it. Heaven on earth is a state of complete peace. It's achievable, if we find the power to let go. Now to just figure out how to let go. Richard Bach wrote: You are always free to change your mind and choose a different future, or a different past. I think that is what nostalgia is, choosing a different past. If we can choose a different today, then we've found the elusive Heaven on Earth. It all depends on what you choose to focus on, doesn't it? And I like that notion of choosing a different past, which of course is also about choosing what to focus on from the past. Oh my. That seems pretty harsh. Tennyson in "Tears, Idle Tears" hits the right note for me on "the days that are no more." I am also fond of Updike's short story "A&P," which many students like. 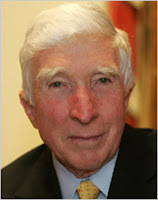 I heard Updike read at JCU in the mid-1970s. That was an experience--I remember his relaxed yet assured presence. I later learned that he was in significant pain and had an emergency appendectomy at University Hospitals several hours after the reading. That's quite a story. I never knew Updike made an appearance at John Carroll. That makes quite an imposing trinity of three major figures to make an appearance there in the mid-70s: Updike, Springsteen and Mother Theresa.